Sumunar Musicians. Photo coutesy Sumunar: Indonesian Music & Dance. 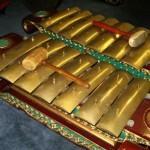 Javanese bronze xylophones: Sarons. Photo courtesy IAS. 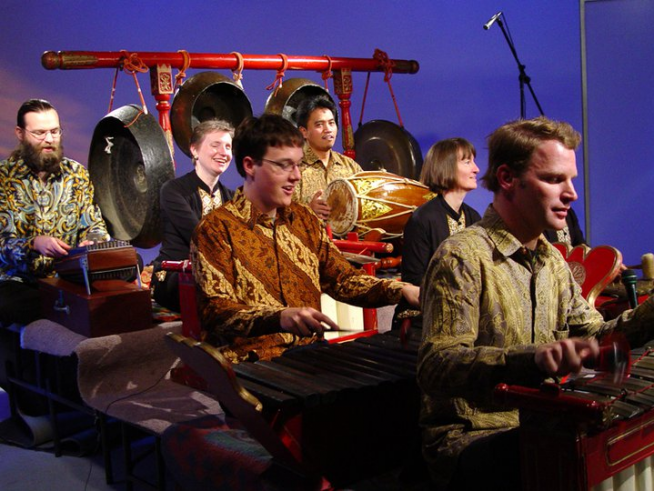 The Sumunar Gamelan Ensemble, directed by Joko Sutrisno, will play traditional Javanese music in an open and informal performance of Javanese gamelan. The sound of drums and bronze instruments will fill historic Memorial Hall, the main lobby of Northrop. Following the Javanese tradition of klenengan, Sumunar will play longer meditative pieces; you are welcome to walk around the instruments, meditate, enjoy a snack or drink, relax with friends, or nap as the spirit takes you. Close your eyes and envision the warm, tropical lands in which this music was invented as the gongs ring out in the night.